Mount Bromo Trekking Tour Package 2 Days 1 Night is special trekking without using the jeep from nearby hotel around Cemoro Lawang. 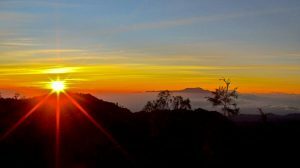 All trip time need 4 -5 hours starting from hotel around Cemoro Lawang at 03.00 AM toward Seruni Peak (the place to see the sunrise), then continue trekking to the crater. For visitors who need to enjoy Mount Bromo Milky Way tour, You must start at 09.00 PM from your hotel. 2 Days 1 Night Mount Bromo tour not only purpose to admire beauty of Sunrise but also all views along your trekking such as Vegetable Fields, Mt Batok, Sea of Sand and Semeru volcano summit (the highest volcano in East Java, Indonesia). Mount Bromo Trekking package Will give You more chance adapted with environments and give You good benefit in body health although the trekking condition is not too rush like Mount Semeru trekking package. Get your lodge around Mt Bromo Cemoro Lawang, Stay all night while enjoy the circumstance. Get the Cemoro Lawang Ngadisari, directly trekking down toward the crater for 3 hours through Cemoro Lawang. 09.00 AM, Reach the Crater by trekking, (If you have more time, You can continue your trek toward the Savannah known as a massive green hill located in northern side of the Crater), Enjoy all views enoughly then comeback to your Hotel to have breakfast, take Shower and relax enoughly until finish. Finish enjoy Mt Bromo Trekking tour package 2 Days, If You have more time, You can continue visit Madakaripura Waterfall (the most popular Waterfall in East Java) located 1 hour from this mountain that also need walking along river Or just directly continue to Surabaya, Malang, Banyuwangi. If You are still beginner want to try Mt Bromo Trekking Package 2 Days, Hope You bring mountain clothes such as Jacket, Shoes, Pole, Flashlight, Mouth Mask and other equipments because the temperature on this mountain top is very cold. For detail information about Mount Bromo tour package, accommodation and other tour package facilities, You can visit Our contact.